Maxwell’s Equations and the Lorentz Force Law together comprise the e/m field equations; i.e., those equations determining the interactions of charged particles in the vicinity of electric and magnetic fields and the resultant effect of those interactions on the values of the e/m field. 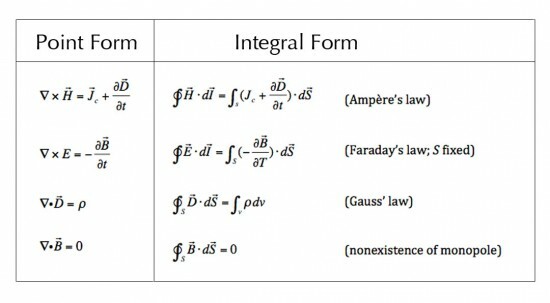 For ease of explanation, the following will refer to “fields” as though they possess some independent physical reality. They do not. The use of fields is as an aid in understanding how forces exerted by and upon real particles, and how the positions (coordinates) of those particles may exist at a given time, or may vary over an interval of time. Field lines are also convenient notational devices to aid in understanding what physically is going on, and are not “real”. An oft-used example is the set of lines or contours of equal elevation relative to some fixed reference value, often found on topographic maps of land areas, and varying pressure distributions on weather charts. Such lines do not exist as real physical entities; they can be used for calculation and visualization of simple or complex phenomena, but they do not effect changes or position or exert force or anything else, themselves. Imagining that they are real is called reification; it can be a convenient aid to better understanding, but it is incorrect to say that field lines of any type are real or “do” anything. A static electric field can exist in the absence of a magnetic field; e.g., a capacitor with a static charge Q has an electric field without a magnetic field. A constant magnetic field can exist without an electric field; e.g., a conductor with constant current I has a magnetic field without an electric field. Where electric fields are time-variable, a non-zero magnetic field must exist. Where magnetic fields are time-variable, a non-zero electric field must exist. Magnetic fields can be generated in two ways other than by permanent magnets: by an electric current, or by a changing electric field. Magnetic monopoles cannot exist; all lines of magnetic flux are closed loops. The Lorentz Force Law expresses the total force on a charged particle exposed to both electric and magnetic fields. The resultant force dictates the motion of the charged particle by Newtonian mechanics. where F is the Lorentz force on the particle; Q is the charge on the particle; E is the electric field intensity (and direction); and B is the magnetic flux density and direction. Note that the force due to the electric field is constant and in the direction of E, so will cause constant acceleration in the direction of E. However, the force due to the combination of the particle’s velocity and the magnetic field is orthogonal to the plane of U and B due to the cross product of the two vectors in vector algebra (Appendix I). The magnetic field will therefore cause the particle to move in a circle (to gyrate) in a plane perpendicular to the magnetic field. If B and E are parallel (as in a field-aligned current situation) then a charged particle approaching radially toward the direction of the fields will be constrained to move in a helical path aligned with the direction of the fields; that is to say, the particle will spiral around the magnetic field lines as a result of the Lorentz force, accelerating in the direction of the E field. The Maxwell Equations are the result of combining the experimental results of various electric pioneers into a consistent mathematical formulation, whose names the individual equations still retain. They are expressed in terms of vector algebra and may appear, with equal validity, in either the point (differential) form or the integral form. Gauss’ Law states that “the total electric flux (in coulombs/m2) out of a closed surface is equal to the net charge enclosed within the surface”. By definition, electric flux ψ originates on a positive charge and terminates on a negative charge. In the absence of a negative charge flux “terminates at infinity”. If more flux flows out of a region than flows into it, then the region must contain a source of flux; i.e., a net positive charge. Gauss’ Law equates the total (net) flux flowing out through the closed surface of a 3D region (i.e., a surface which fully encases the region) to the net positive charge within the volume enclosed by the surface. A net flow into a closed surface indicates a net negative charge within it. Note that it does not matter what size the enclosing surface is – the total flux will be the same if the enclosed charge is the same. A given quantity of flux emanates from a unit of charge and will terminate at infinity in the absence of a negative charge. In the case of an isolated single positive charge, any sphere, for example, drawn around the charge will receive the same total amount of flux. The flux density D will reduce in proportion (decrease per unit area) as the area of the sphere increases. Gauss’ Law for Magnetism states that “the total magnetic flux out of a closed surface is zero”. Unlike electric flux which originates and terminates on charges, the lines of magnetic flux are closed curves with no starting point or termination point. This is a consequence of the definition of magnetic field strength, H, as resulting from a current (see Ampere’s Law, below), and the definition of the force field associated with H as the magnetic flux density B = μH in teslas (T) or newtons per amp meter (N/Am). Therefore all magnetic flux lines entering a region via a closed surface must leave the region elsewhere on the same surface. A region cannot have any sources or sinks. This is equivalent to stating that magnetic monopoles do not exist. which states that “a differential (i.e., tiny segment of) magnetic field strength dH at any point results from a differential current element I dl of a closed current path of current I). The magnetic field strength varies inversely with the square of the distance R from the current element and has a direction given by the cross-product of I dl and the unit vector ar of the line joining the current element to the point in question. The magnetic field strength is also independent of the medium in which it is measured. where the integral is a closed line integral which may close at infinity. Alternatively, by definition of curl, Curl H or Δ×H = J, the current density. This effectively means that a magnetic field will be generated by an electric current. However, this only applies to time-invariant currents and static magnetic fields. As Jc = σE, this implies that the electric field is constant as well. arising from the rate of change of the electric field E.
Maxwell’s correction, as included in the revised Law, dictates that a magnetic field will also arise due to a changing electric field. Thus if B varies with time there must be a non-zero E present, or, a changing magnetic field generates an electric field. The minus sign in the equation above indicates Lenz’s Law, namely “the voltage induced by a changing flux has a polarity such that the current established in a closed path gives rise to a flux which opposes the change in flux”. In the special case of a conductor moving through a time-invariant magnetic field, the induced polarity is such that the conductor experiences magnetic forces which oppose its motion. electric field, gyrate, Lorentz Law, magnetic field, Maxwell's equations. Bookmark.